Citrus fruit is a big industry in my part of Florida. I have several friends who have lemon, lime, or orange trees in their yards, and who are willing to share their bounty! One friend gave me six limes, which I used to make Lime Curd. Lemon curd is typically served during English tea, but I love limes even more than lemons. I used a lemon curd recipe, swapping out the lemon juice and zest for lime juice and zest. As always when I experiment, I hope for the best (delicious food), but am prepared to try again if the results don’t match expectations. This turned out to be as tasty as I had hoped, and I used the lime curd to make Lime Curd Mousse tarts. For today, we’ll focus on the lime curd itself. It’s easy, but labor intensive. This is one thing you can’t walk away from, but the results are well worth it! Combine zest, juice, and sugar in a large heavy, non-aluminum saucepan. Heat over medium-high heat just until boiling. Remove from heat, and temper egg yolks by gradually adding in hot juice/sugar mixture, one ladleful at a time, whisking constantly. When you’ve incorporated about 1/4 of the hot mixture, pour the egg/juice/sugar mixture into the pan with the rest of the hot juice/sugar mixture, whisking constantly. Place the saucepan over medium heat, and cook, whisking constantly, at least 10 minutes, or until mixture becomes pudding-like in consistency. Add butter, in batches, whisking constantly until butter melts and is well-incorporated before adding more butter. Remove from heat once all the butter is melted and mixed in, and strain through a wire-mesh strainer into a bowl. Place plastic wrap directly on top of warm curd, to prevent a skin from forming. Chill at least 3 hours. This curd can be eaten with scones and clotted cream, or used as an ingredient to make lime curd mousse. Any way you eat it, there is a nice balance of sweet and tart! 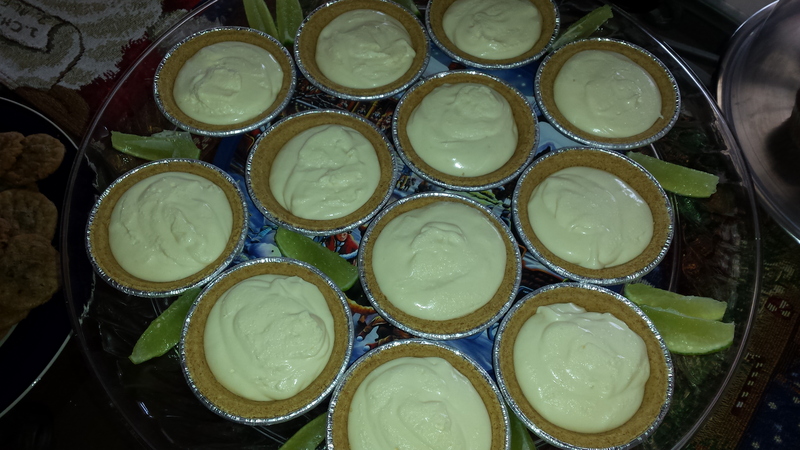 Pictured above are Lime Curd Mousse Tarts, made using Lime Curd.